More things we wanted to have, the more complicated was to create our desired site: Connections to databases, code, server side applications, disk space, security… real hell! Fortunately times have changed and the web has become a place where not only one can watch what others do, but a place where we can interact, exchange views, share content, learn and teach. the new frontier of social communication. Patapage is the superHero of the new World Wide Web era. It lets any site interact with people in the easiest way we could have thought, without compromising your way of working and designing and without any server side implementation. What are the tools that it can offers to make our site more accessible, without requiring intellectual efforts and waste of time and money? I’m sure you thought at least once: “It would be nice to give chance to those who visit my site to leave a comment … But how can I do it? “. There are few on-line services dedicated (disqus or JS-Kit Comment, just for example) more or less they do all the same; they let you have comments on your page, but nothing more. Patapage lets you add comments referring to any content on your page and as many you need per page. You can show comments inside your site environment or as overlay (to lay or place something over or upon something else), display comments as thread or flat, moderate them by administrator or by email… Really a lot of features managed in a really simple way. They just want to open their site, click on their page, edit their content… is it possible? With Patapage you can add as many contents as you need on every page of your site without the need of a CMS. 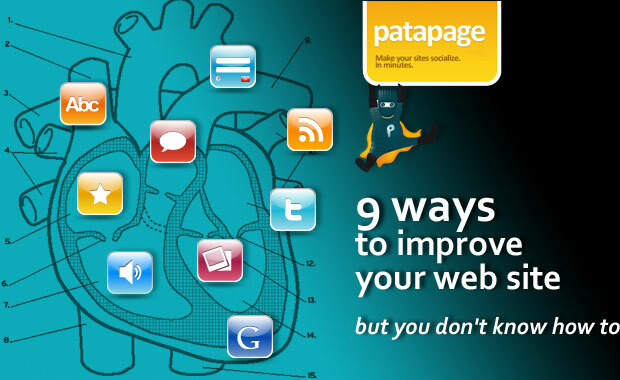 Patapage offers a powerful tool to let every body contribute even on a static site! Nice, isn’t it? How can people find specific arguments on your site if you don’t have a search engine on it? If you think that the only solution to make your content be searchable on your site is to manage your site with a CMS… Well you are wrong! Google offers its service to search words only inside your site, and it works! Fortunately Patapage let you add Google power just into your site, so that any body can find what they were looking for just remaining in your site! Letting people easily get in contact with you is one of the primary scope of having a website. Of course you can just link an e-mail… but, you know, this is not really professional and it’s quite dangerous for spamming… So, how can people contact you? … Mumble …mumble… A contact form! No, you don’t need to link your email anymore! Patapage offers to you the opportunity to include a contact form with its own Captcha security tool to prevent spamming; Patapage will also collect all the requests from your site on your Patapage account. And what about your YouTube videos? if you have videos of your events or some explanation one… Wouldn’t be nice to have it shown on your site? And what about the possibility of changing it without the need of working on the code of your page? Patapage can do it for you! With Patapage you can easily add Flickr photo gallery shows or YouTube, Vimeo, Flickr video gallery on your pages. So, show your creativity! Are you a musician? Or a music Lover? Patapage let you add your Playlist directly on your site! Let people listen to you! How could you taste what people think about your articles? Is there a simple way to have feedback from your readers on a page-by-page basis? Well, first of all add a comment system on your article page (view point 1); than you can have a Star rate tool to collect one click opinion from your public. Rating is the most comfortable way to let people leave their opinion anonymously. And is the fastest way for you to understand what people like. But… how can you store all the rates people did? mhh… Oh yes! Patapage will do it for you! Just add the tool and your articles can be rated right now! And you’ll have all rate statistics stored on your Patapage account! More and more people are using blog to communicate their ideas; blog is really a great media to share opinions. Some times we need to show on our site some related content from some other origin; we can copy that content and paste it inside our HTML page… But that could complicate the layout of our page… Could introduce bugs on the code… And what if author will change the original content? Youll’have a downgrade version!! Why don’t we use their RSS feed to publish the content’s? … Yes, but How?! Patapage lets you add any RSS feed from other origins directly into your page; give the feed URL to Patapage and it’ll do the rest! Ok, which is the typical way web users communicate to others their web experience? Twitter! Yes, they use twitter for everything and especially to say the world how lovely is your site or your article. And how could you know if someone is talking about you? and how could you facilitate retweets for your visitors? Again Patapage can help you (What an Hero!). This not exhaustive showcase of Patapage functionalities demonstrates how the web has become a more affordable sharing platform than we could have thought just few years ago. We no more need complex tool to communicate; as happens with many technological innovations, The more time passes, the more simple and powerful they became. If you are interested on Patapage hero, visit http://patapage.com, and don’t be afraid to test it, you’ll love it! Thank you very much for all helpful ideas! You’ve done it again! Amazing writing! ← jQuery.mb.mediaEmbedder 1.0 is out!